CES is always a hotbed of new TV tech, and this week we'll see new models from all of the major manufacturers. One of the trends we're seeing with this year's models isn making it easier to hide away the tangle of cables that make up most entertainment centers. If you have a TV mounted on the wall right now, you probably know what an ugly mess it can be. Samsung's new QLED TVs kills the clutter. A transparent cable—nearly invisible against the wall—runs from the television to a box that connects to your Blu-ray player, streaming media player, gaming console and any other gadgets you might have (you can plug in up to four devices). Though you can opt for a more traditional mount, these sets have a mount built into the back of the television, letting them hang flush against the wall. The finished product looks a lot more like a picture frame than a television, and it keeps your focus on what you're watching rather than what's around it. Samsung has also addressed off-axis viewing angle problem that LED TVs have had in the past — colors would shift and the image became virtually unwatchable when you were sitting too far off-center. Samsung's QLED sets don't have this problem: an extremely wide viewing angle provides a clear picture no matter where you're sitting. And it wouldn't be a new TV without improved picture quality. 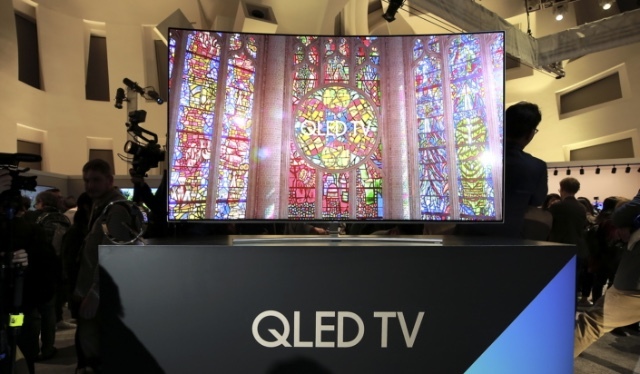 Samsung's new LED sets use a new quantum dot technology, which can display up to a billion different colors, enhances brightness and improves contrast. These screens can display vibrant colors and true blacks for near-perfect image reproduction. With QLED offering high picture quality and a distraction-free mounting system, the experience is more immersive—like being in a movie theater instead of your living room. And, of course, these sets will have smart features, too. Samsung's latest smart interface has been streamlined, giving you a unified view of all content available. You can see all of your entertainment options—including live TV, streaming services and other devices in your entertainment center—all from a single interface. The Smart View mobile app (available for Android and iOS) lets you control the whole system from your phone as well as your remote.